Elevit is a once-daily pregnancy multivitamin that has been specifically formulated to help support your baby's healthy development from conception. Elevit has more folic acid and iron than any other pregnancy multivitamin, as well as iodine and other important vitamins and minerals. It's Australia's number 1 pregnancy multivitamin*. Folic Acid - a supplemental from of folate, is clinically proven* to reduce the risk of neural tube defects like spina bifida. *De-Regil LM, et al. Cochrane Database Syst Rev 2010, Issue 10. Art. No. : CD007950. 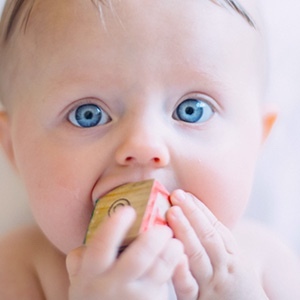 Iodine - is an essential nutrient for the growth and normal development of baby's brain. Vitamin B3 - as a part of a range of additional vitamins and minerals to help support baby's development. Planning to fall pregnant? Elevit is a once-daily pregnancy multivitamin that has been specifically formulated to help support your baby's healthy development from conception. It can take time to build the higher level of nutrients your body will need to support you and your growing baby. Therefore, Elevit should ideally be taken from at least one month prior to conception, and then throughout your entire pregnancy. 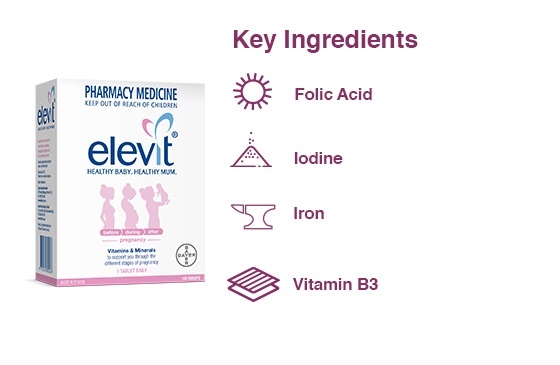 Elevit has more folic acid and iron than any other pregnancy multivitamin(1), as well as a high level of iodine and other important vitamins and minerals. Folic acid is clinically proven to reduce the risk of neural tube defects like spina bifida(2), iron helps in the formation of the red blood cells which prevent iron deficiency while iodine assists in the baby’s brain development. It is Australia's number 1 pregnancy multivitamin(3). - One convenient tablet per day. - Folic acid is clinically proven to reduce the risk of neural tube defects, such as spina bifida*. - Available in two pack sizes - 30 tablets and 100 tablets. Always read the label. Use only as directed. Vitamin Supplements should not replace a balanced diet. Keep out of reach of children. This product contains selenium which is toxic in high doses. A daily dose of 150mcg for adults of selenium from dietary supplements should not be exceeded. Suitable for use by adults only. Do not exceed the stated dose of folic acid except on medical advice. Vitamin supplements should not replace a balanced diet. Contains sucrose. Folic Acid 800 µg, Iron (as Ferrous Fumarate) 60 mg, Iodine 220 µg (as Potassium Iodide), Thiamine (Vitamin B1, as Thiamine Nitrate) 1.4 mg, Riboflavine (Vitamin B2) 1.4 mg, Nicotinamide 18 mg, Pantothenic Acid (Vitamin B5, as Calcium Pantothenate) 6 mg, Pyridoxine (Vitamin B6 as Pyridoxine Hydrochloride) 1.9 mg, Cyanocobalamin (Vitamin B12) 2.6 µg, Ascorbic Acid (Vitamin C) 85 mg, Cholecalciferol (Vitamin D3 200 IU) 5 µg, DL-Alpha Tocopherol (Vitamin E, as DL-Alpha Tocopheryl Acetate) 18.7 mg, Biotin (Vitamin H) 30 µg, Calcium (as Calcium Hydrogen Phosphate Anhydrous, Calcium Pantothenate and Calcium Carbonate) 125 mg, Magnesium (as Magnesium Oxide-heavy And Magnesium Stearate) 100 mg, Copper (as Cupric Sulfate Anhydrous) 1 mg, Manganese (as Manganese Sulfate Monohydrate) 1.9 mg, Zinc (as Zinc Citrate Trihydrate) 11 mg, Selenium (as Sodium Selenite) 50 µg. 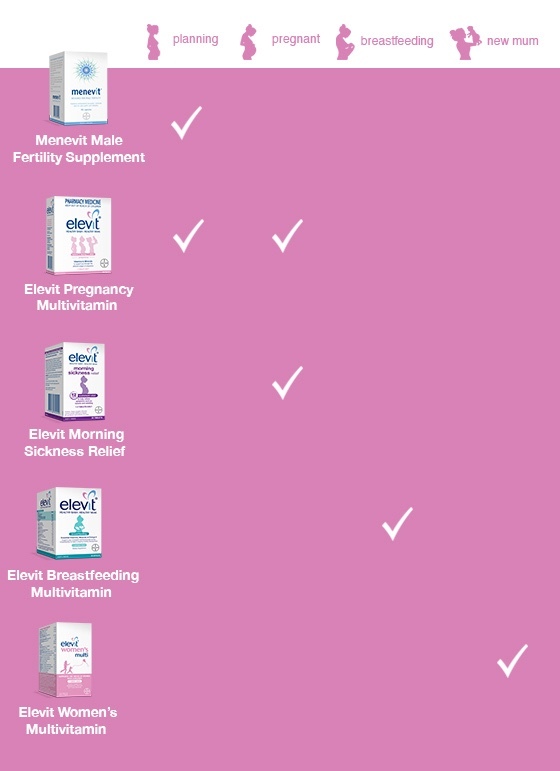 Take Elevit for at least one month before pregnancy, throughout pregnancy and the breastfeeding period. Elevit Pregnancy Multivitamin Tablets 100 Pack (100 Days) is rated 4.8 out of 5 by 156. Rated 5 out of 5 by Linh1108 from Great product I am very happy cause I bought this .. Rated 5 out of 5 by isabellpurse from Exactly what it says it does! It’s been just over a month and it’s been bliss. No yucky side effects! Those extra vitamins are a godsend. I’ve already recommended this to all my friends! Literally don’t look any further! Rated 5 out of 5 by AD27 from No complaints, product as described. Rated 5 out of 5 by Apdwalker from Reliable product I bought this product a little over a month ago due to my doctors recommendation. I’m very happy with it. It’s easy to take, just the 1 tablet a day and it’s super easy to swallow. I’ve had no noticeable side effects and my doctor is happy with my results, so I’m happy.